Visitors can experience the “Romance of the Ranchos” at The Homestead Museum to experience life on an early California rancho from 1 to 5 p.m. on Sunday, May 3. Admission is free. Activities include mariachis, demonstrations, historic house tours, crafts and more. The Rancho La Puente was once nearly 49,000 acres. The Homestead Museum sits on six acres of the original property. This is a festival for life in the area between the 1840s and 1860s. Living history characters include Don Pio Pico, the last governor of Mexican California, who will be portrayed by Roberto Garza. Music and dancing will be provided by Mariachi Monumental de America and Dogtown Filharmonik, as well as colorful folklorico dancers. Rancho life will be represented through exhibits, blacksmith, rope making, pottery demonstrations, woodcarvers and an expert roper. The Homestead Museum is at 15415 East Don Julian Road in the City of Industry. For information, call (626) 968-8492 or visit www.homesteadmuseum.org. Happy birthday Puccini! Opera Tales will celebrate the anniversary of the composer’s birth by telling the stories from several of his operas Thursday, April 30, in the Rowland Heights Library. Seating is limited and will be provided on a first-come first-served basis with priority given to children in grades K-6. Tickets for seating will be handed out at 6 p.m. for the 7 p.m. show. Funding has been provided by Los Angeles Supervisor Don Knabe. The Kiwanis Club of Hacienda Heights will hold its annual All-You-Can-Eat Ribfest takes place from 5 to 9 p.m. on Sunday, May 3, at the Industry Hills Expo Center Pavilion, 16200 Temple Ave. in the City of Industry. Tickets are $30 each or $250 for a table of ten. Ribfest 2009 is much more than enjoying a delicious meal. The festive evening includes live and silent auctions, and the election and crowning of Miss 4th of July, who will participate in the club’s annual Fourth of July parade in Hacienda Heights. Students from the high schools in the Hacienda La Puente Unified School District compete for the honor. Donations can be sent to 2380 Ardsheal Drive, La Habra Heights, 90631. For tickets and event information, and for club information, contact President Lon Salgren at (562) 713-5204 or (562) 694-0882. 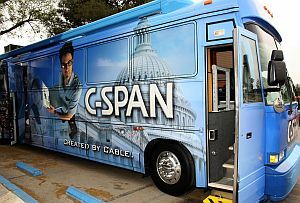 The C-SPAN Civics Bus rolled into Hacienda Heights on Thursday to visit students at Los Altos High School. The bus is on its “100 Days, 100 Schools” tour to mark President Barack Obama’s first 100 days in office. This was the 45-foot mobile production studios’ 87th school. It began the week in Sacramento, spending the morning at Taft High School in Woodland Hills before coming to the San Gabriel Valley. C-SPAN took the opportunity to honor five Los Altos seniors who won honorable mentions in its StudentCam national video documentary competition. It’s a magical day in Rowland Heights. And magician Jay Leslie is bringing his magic show to the local library for a special teen program at 4 p.m. today. The fun show will be presented in the community room. So come out and share some magic this Earth Day. For more information, call Adrian Romero at (626) 912-5348. Thousands showed up for today’s job fair at the Industry Hills Expo Center. A reported 3,500 hopefuls talked to company recruiters to try and find those elusive jobs. That number more than doubles the 1,500 that showed up for last year’s job exposition. In this economy, positions seem harder to find. Read all about the event in an upcoming story. The City of Industry’s Job Fair & Expo tomorrow is expected to draw thousands of job seekers. The event will be from 10 a.m. to 2:30 p.m. on Tuesday at the Industry Hills Expo Center, 16200 Temple Ave.
And organizers expect more than 2,000 people to look for jobs with 45 employers and exhibitors who will fill the center. That’s compared to the 1,400 jobseekers who attended last year’s annual event. “I expect a huge turnout, because of the fact that so many people have been laid off,” said Charlene Gregoroff, assistant to the CEO at BioTouch, a Walnut-based cosmetics company that produces permanent make-up. But a large turnout could mean a “perfect market” of applicants to choose from to fill a communications position, sales jobs and expense manager position, she said. BioTouch is one of many employers and job training organizations that will be on hand Tuesday. They include 24 Hour Fitness, the LAPD and the Los Angeles County Sheriff’s Department, Devry and the Hacienda La Puente School District, among others. The job fair comes on the heels of state data out Friday reporting 11.4 percent unemployment in Los Angeles County. Earlier this month, a Rancho Cucamonga job fair drew nearly 4,000 jobseekers, looking for work. Read Ryan Carter’s story in the Hacienda Heights Highlander. The Homestead Museum is celebrating National Volunteer Week by recognizing its staff of volunteers at an awards dinner at the Kellogg West Conference Center on Saturday, April 25. The local museum has 79 volunteers who conduct tours, staff special events, and help with the museum’s collection and administrative tasks. Fourteen individuals will receive awards, including Eldon Dunn of Hacienda Heights. Since 1984, Dunn had volunteered more than 5,000 hours at the museum. The Homestead Museum is always looking for volunteers. Anyone 14 or older can apply. Applications are being accepted for the next volunteer orientation on June 17. For more information, call Steven Dugan at (626) 968-8492 or visit homesteadmuseum.org. The Good Time Travel Club at the Steinmetz Senior Center in Hacienda Heights will see a performance of “Cirque Le Masque” at the Carpenter Center in Long Beach on Saturday, April 25. The cost is $49 for members and $54 for nonmembers. This includes transportation, lunch at Arnold’s Cafeteria and the show. The bus leaves at 10 a.m. and returns at 6 p.m. The senior center is at 1545 Stimson Ave. For information, call (626) 934-7041.